Companions of the Mosque will be organising Eid Prayers followed by the usual gathering for the family for the seventh consecutive year. 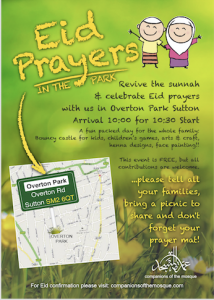 This will be held at Overton Park, Sutton on 21 August from 9am till 2pm. The salaah start promptly at 10.30am. Please arrive by 9.15am to avoid the traffic rush. This is a picnic event for the entire family: Please bring a picnic food basket to share with your family, a mat to pray on and a foldable chair to sit on. There will be no chairs available. All contributions are welcome! Please email info@companionsofthemosque.com if you have any queries or would like to help. Companions of the Mosque will be organising Eid Prayer in the park for the family for the 8th year! Date to be confirmed – please watch this site on the Thursday 14 June 2018 after 7.30pm for Eid confirmation. 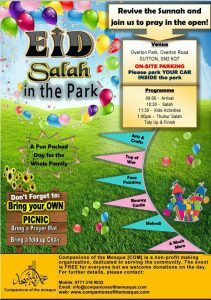 Please arrive by 9.30am for the salah at 10:30am sharp – arrive at the park early to avoid any delays. As ever don’t forget your prayer mat. Also, remember to bring water and a picnic – anything spicy lamb based will be gratefully received by the MC! Companions of the Mosque will be organising Eid Prayers followed by the usual gathering for the family for the seventh consecutive year. This will be held at Overton Park, Sutton on 1st September 2017 from 9am till 2pm. The salaah start promptly at 10.30am. Please arrive by 9.30am to avoid the traffic rush.